Bumchum is the healthiest disposable diaper available in India! BumChum brings a unique twist to diapering. 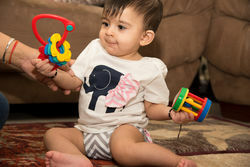 It is both a disposable and reusable diaper and is paired with a cute T-shirt that will not ride up every time you pick up the baby. The soft cotton fabric of the diaper allows the flow of air that helps prevent rashes and growth of bacteria. The disposable inserts are made from nontoxic, non-bleached bamboo fiber based materials . Bamboo fiber is naturally antibacterial, easier on the babys sensitive skin and helps prevent rashes. These inserts are also biodegradable ( wet ones only) hence good for the environment versus the other disposable diapers which take 500 years to decompose! Together they are comfort baby wear that make your munchkin look chic and happy. A smart cover in cute designs. It does not require pants or any waterproof layer. High quality t-shirts with custom extra length so that they don’t ride up every time the baby is picked up. Soft nylon pouch with soft border that's easy on the baby's sensitive skin while being waterproof at the same time. Disposable inserts made of bamboo fiber which reduce nappy rash. These are wood pulp based and use non-toxic materials for absorbency that do not cause damage to the baby’s sensitive skin. They are biodegradable and are therefore better for the environment. The superior gusset design of these inserts helps contain the mess and allow for the reuse of the diaper multiple times in the same day. Apart from this BumChum has a separate line of reusable diapers for newborn babies. These are made from unbleached organic muslin and are the safest alternative against a newborn baby’s sensitive skin. These nappies have a 'umbilical cord snap down' for the first week of use. These nappies are secured with our patented design silicone pins that are safe, cute and fun and are easy to use with our newborn diapers. And there is no danger of the baby getting poked with metal.